A 6-year-old boy presented with progressively increasing upper backache and left lower limb weakness for 4 months. Examination revealed spasticity with exaggerated deep tendon reflexes in the left lower limb. The magnetic resonance imaging (MRI) showed a ventrally placed, 2 cm, well defined, intradural extramedullary, round lesion at T9, more on the left side displacing the cord to the right. It was hypointense on both T1 and T2-weighted images and enhancing with gadolinium [Figure 1]. There was no extradural or extra spinal involvement. The bone was normal. He underwent a left T9 hemilaminectomy and total excision of the tumor. At surgery, the tumor was firm with an attachment to the ventral dural. Post-operatively there was a significant reduction in spasticity. The histopathology was consistent with mesenchymal chondrosarcoma. Solitary fibrous tumors have been reported to occur in the intramedullary, intradural and extramedulary compartments of the spine. They almost always show a characteristically hypointense signal on T2-weighted MR sequence. Though this finding may be unique to this tumor type; meningiomas and hemangiopericytomas have been reported to show similar findings. Mesenchymal chondrosarcoma that involves the bone is osteolytic with ill-defined margins and occasional sclerosis. However, rarely they can present without any bony involvement. Li and Yao  have reported observing clear visible varices surrounding the cord as well as multiple punctuate regions of low intensity suggesting calcification - both of which were not seen in our case. Prominent contrast enhancement is universal. Some are lobulated with distinct margins. Despite its advances, imaging is not conclusive and histopathological examination alone provides a definitive diagnosis. Even with adjuvant chemotherapy and radiotherapy the 5 year survival rates are in the range of 42-55%. We suggest that the differential diagnosis of a primary intradural tumor in children should include tumors of mesenchymal origin. 1. Obuchowicz AK, Szumera-Cieækiewicz A, Ptaszyñski K, Rutynowska-Pronicka O, Madziara W, Tiszler-Cie?lik E, et al. 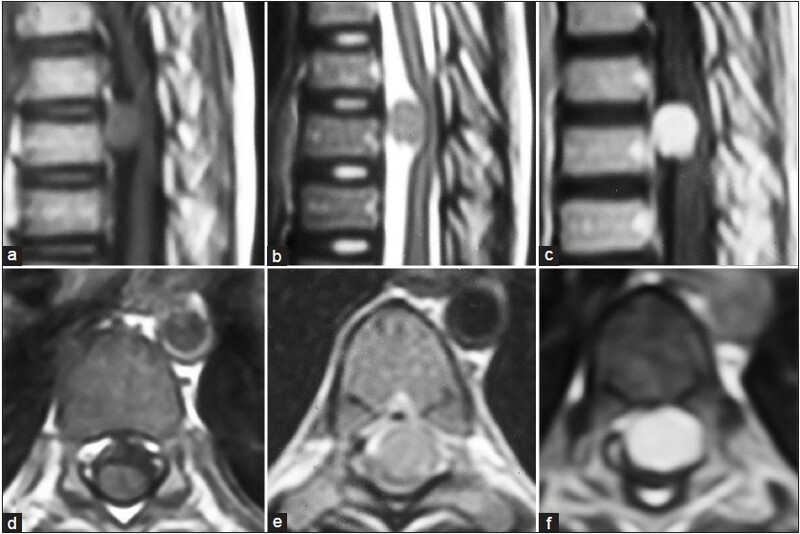 Intraspinal mesenchymal chondrosarcoma in a 14-year-old patient: Diagnostic and therapeutic problems in relation to the review of literature. J Pediatr Hematol Oncol 2012;34:e188-92. 2. Ranjan A, Chacko G, Joseph T, Chandi SM. Intraspinal mesenchymal chondrosarcoma: Case report. J Neurosurg 1994;80:928-30. 3. Li YH, Yao XH. Primary intradural mesenchymal chondrosarcoma of the spine in a child. Pediatr Radiol 2007;37:1155-8. 4. Belhachmi A, Akhaddar A, Gazzaz M, Elasri C, Elmostarchid B, Boucetta M, et al. Primary spinal intradural mesenchymal chondrosarcoma. A pediatric case report. J Neuroradiol 2008;35:189-91. 5. Karikari IO, Mehta AI, Nimjee S, Hodges TR, Tibaleka J, Montgomery C, et al. Primary intradural extraosseous Ewing sarcoma of the spine: Case report and literature review. Neurosurgery 2011;69:E995-9. 6. Jallo GI, Roonprapunt C, Kothbauer K, Freed D, Allen J, Epstein F. Spinal solitary fibrous tumors: A series of four patients: Case report. Neurosurgery 2005;57:E195.